An ATLAS homunculus and precedessor to the female model VIII, Rami was a combat model, with gemstone organs and silver transmutation as weapons, as well as four increasing levels of overclocking power-ups that destroyed his innards more with each use. A cold, emotionless 'butler' for Caster who obeyed her every wish and seemed to have no desire of his own, treating her more like his Master and replying 'as you wish' to even her most absurd orders. He was, in fact, hopelessly in love with her on first sight - a fact that did not convey through his doll-like facial expression - and was exactly what Caster had been wishing for all along, a fact she doesn't realize until his dying moments later in the story. 'As you wish' was a mean little Princess Bride reference, but I wanted to use it so. Cleopatra, the third strike GO dealt to me. Mine had a NP based on the desert she created in Turkey, making her fight like a mix between Gaara and Gilgamesh. 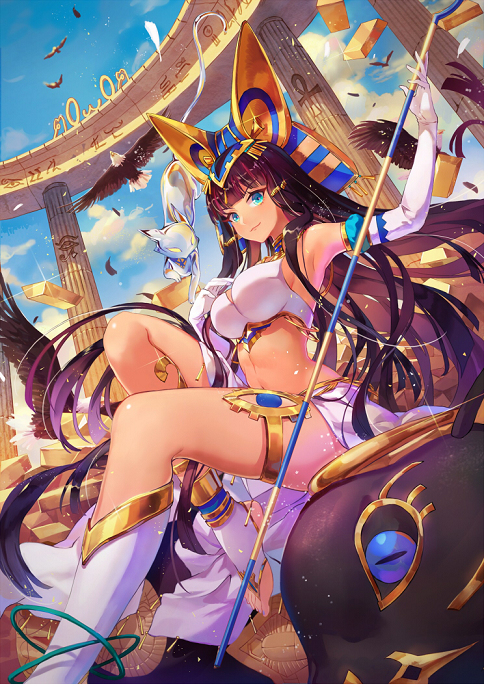 The NP sounds mundane until she is using it to create an immense desert, all of which she can turn into flechettes, sphinxes, spiked pits, etc. with little more than eye contact. She could kick up a sandstorm and then turn the entire thing into a wall of flechettes to tear you apart or just regenerate constant undying familiars to fight for her, while protecting herself with a reinforced sand shield. Her wish was to become powerful enough to secure her safety and make others love her, never realizing that her methods denied her means by always making more enemies. She would be the first to discover Bardsley's true nature and what lie beneath the soil, trying to 'drill' into the grail's core. Her lair would be a mean surprise - she was camping at one of the island's two beaches, eating tourists and collecting forced priestesses for mana. It would only be confirmed accidentally, by an island native, that the island didn't -have- two beaches - the second one was created by Caster and maintained as a tourist trap during the course of the war. Her ultimate fate is discussed below in Rider's section. Not his actual name, but the nickname given to him by Rider when he refused to identify himself. It sticks as a name and he feels no compulsion to divulge any more than that about himself. He seems like a pretty ordinary young man in his teens, around the same age as Saber's master and Michel - my mental image is a baseball jacket and short hair like Berserker's Master Tatsumi in Prototype Fragments. I never fully developed him, unfortunately. His relationship with Rider is strictly professional at first, but grows amiable over time, mostly against his will. The real reason for not giving his name wasto hide as long as possible that he's the big brother to a female NPC who plays a supporting cast/Sakura-ish role to Saber's master, and who is secretly the actual heir to their family's magecraft. But the goal was to invert the Shinji relationship because Kiddo is actually fighting in the war entirely for her sake trying to spare her the danger/risk since her personality was not very well-suited to battle, much less battle against one she likes. So he's actually a good brother who took the position of Master from her entirely by praying so strongly for it and relying on his latent, unused potential as a magus after she succeeded instead of him. She has the training and higher potential, but he desired to protect her more so that trumped in connecting to the Grail. This would lead to their big fight, in which the entire Desert of Heaven was marshalled against the entire Wild Hunt, in a large-scale sandship battle in which Drake kept hopping from ship to ship and protecting the Hind from Cleo's sight with other ships and the cover of the sand, with an ultimate goal of getting the Hind close enough to perform a close-distance kamikaze strike against Cleo directly. She would approach the downed Cleo, ready to kill her, and unaware Cleo saved at least a little more sand to stab her through the back when she gloated - only to be shocked when Drake coldly, quickly executed her without a word as queen. Probably my favorite isolated scene after that would be Kiddo finding her in the desert, first tracking her by a trail of blood... that turns out to be spilt rum as Drake sits on the wreckage of the hind, defusing the tension before confirming some of it WAS blood and she did get impaled at the same time she killed Cleo, bleeding out while the two share one last moment. Based on and in the same family as Sagara Hyouma, Jack's failure summoner in the Apocrypha oneshot. Weak and unimpressive as a magus family, the Sagaras were chemists whose circuit quality diminished over time, as they went from creators of potent poisons to little more than cheap magi drug peddlers, lacking the ability to seek the root with their meager talents and loathsome concoctions. Hyouma was little more than an unambitious, potion-peddling drug dealer in the city the war takes place, with no desire to compete when the Grail selects him to fill the last spot as Assassin's master. A slimy, unscrupulous youth whose life was going nowhere and who goes along with Ruler's offer of riches and advantage to whoever uncovers the reason for Ruler's calling to this HGW. During the story, Assassin does his best to teach Ryouma and impart actual values on the delinquent, trying to improve his character for the better as Assassin battles each Master in the grail war, using his skills to escape after each meeting with another Servant, but not killing anyone decisively. They would gradually discover none of the Servants or masters were abberations save Ruler himself, a discovery that would lead Ruler to using a Command Spell to order Assassin to kill himself. Surprising himself, Ryouma would try to rescue Assassin, only to be killed at the door by the priest of the chapel, for reasons he couldn't understand before he died. The legendary outlaw of Feudal Japan, Ishikawa Goemon was a thief who pilfered from rich lords in order to return their riches to the poor. While documented as little more than a common thief in life, after his death Goemon became an incredible folk hero, with stories of his life attributing him the status of a samurai, a ninja, and even a wizard in folk tales and kabuki performances for generations to come. However, the most famous tale of Goemon is the one that led to his death. Attempting to assassinate the warlord Toyotomi Hideyoshi, Goemon was overheard in the act and sentenced to a public execution along with his entire family by being burned alive in a boiling cauldron. It is said that Goemon held his son above the boiling water even as he died in defiance of his enemies, saving the boy's life at the expense of his own. Yet even that legend is inconsistent and may never have truly occurred - records disagree on everything from the date to the outcome of the execution. As a Servant, Assassin would have no real stake in the war - like Cu, he doesn't wish for much, and just enjoys his time as a Servant. He and Ryouma would fight the other Servants one by one as the only team who seriously carried out Ruler's order to investigate the cause of the war. They would gradually discover none of the Servants or masters were abberations save Ruler himself, a discovery that would lead Ruler to using a Command Spell to order Assassin to kill himself. Assassin would choose to interpret this order as 'suicide by Ruler', killing himself by forcing himself to fight Ruler himself. He would kill a few of Ruler's summoned constructs before being grandly slaughtered by Ruler's second NP. The Ruler of the Bardsley Grail War, King Solomon, the King of Magic. You can imagine one of the reasons I abandoned this project now. He would task the Servants with investigating the reason he was summoned, promising his favor to whoever first ascertained the danger to the world. ...But GO didn't hurt as much as you'd think, because he -wasn't- the real Solomon. He was a fictionalized creation of the Gamemaster, impersonating a Ruler and empowered by false imitations of the real Solomon's feats. In reality, he was the Gamemaster's pawn and front to the others, until he chooses to act. As a result of his extensive magical knowledge and wisdom, Ruler is particularly skilled at understanding and deconstructing magical attacks and magecraft of all ranks and complexity before they can affect him. However, it cannot deal with sacraments of the Church. If summoned as a Ruler, during a direct encounter, a Servant's true name and entire status information will be automatically revealed. At this rank, this functions even regards to Servants with concealment abilities, but a luck check is required to reveal all information. Ruler's privilege. Two Command Spells can be used for each Servant participating in the Holy Grail War. However, he cannot repurpose others' Command Spells. Among the many feats and legends connected with Ruler's kingship, the most famous among occultists is his prowess in taming demons and djinns to his will. Said to have imprisoned or contracted with spirits of all ranks, Ruler is said to have bound them and put them into service as advisors and aides, helping to achieve his great works in life. Among the myriad spirits commanded by him, the most famous of them all are the 72 demons enshrined in the grimoire that came to be known as the Ars Goetia, itself a mere piece of a larger work supposedly penned by King Solomon himself, though evidence suggests his name was only borrowed to give the ideas of others more persuasive weight. Taking the form of an ornately-inscribed set of rings on his fingers, the Ars Goetia embodies the 72 demons that, while not actually his retinue in life, have become his representatives as a Servant due to the fame they achieved after their fictional creation. Not the summoning of true demons, but manifestations of Ruler's legend and magical power given specific forms, they are more akin to imaginary creatures produced and sculpted by Ruler himself, made manifest in the real world. As they are merely externalizations of Ruler's magical power, they have no real life of their own, and their tangible destruction only 'returns' that amount of power to Ruler, leaving him free to call upon one of the remaining 71. Only energy expended by the demons themselves is actually used up. Like the Ars Goetia, a false Noble Phantasm that originates not from Caster's own life and experience, but from the accumulated knowledge attributed to him by others in antiquity. For generations, grimoires were falsely attributed to King Solomon as a means of authenticating them - in some cases, this gave attention and increased mystery to fledgling works of magecraft that would otherwise have floundered, but often it was simply a means of legitimizing forgeries and fakes. Regardless of the truth, an untold number of works claim to have been penned by Solomon, and this has become crystalized as Ruler's second Noble Phantasm. Once his temple is complete, Ruler is able to call upon the accumulated knowledge and power of "his" many grimoires, books of powerful magic and curses that line many surfaces, shelves, and compartments in his shrine. A nearly infinite repository of magic spells of every discipline and attribute stand at Ruler's beck and call, allowing him to flip the pages of any grimoire he needs, often casting his spells directly from the many books themselves, en masse, the magical equivalent of summoning a wall of weapons in mid-air. More than a "skeleton key," it is more accurate to call this the absolute privilege accorded to Ruler as one of the wisest mages in history, even if much of that wisdom is false in origin. 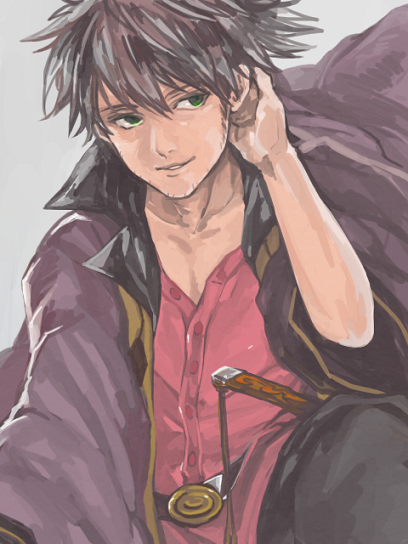 The prerogative of one qualified to call himself "emperor" of the kingdom of magic. (Picture Gate of Babylon with thousands of spellbooks flipping open throughout his temple and you've got the idea). Of course, his normal life is the one he had before he adopted the facade of a human priest. 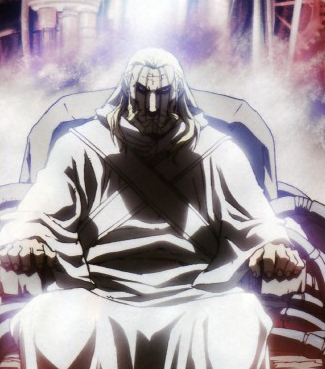 In reality, Father Murphy is not the overseer of the war, but the Gamemaster - responsible for the creation of the imitation of the Fuyuki System and its chief beneficiary. In truth, there is no Grail, and there is no Grail War - he has crafted the Servants out of glass vessels and conducting a farce in which the only recipient of their collected energy is "Murphy" himself. His real identity is Taliesin the Bard, one of Britain's five great poets and a legendary musician whose origins trace to Arthurian times. It is said he began his life as the slave to a great magician, who betrayed his master and her son by stealing the secrets of all the wisdom and knowledge in the world that was her son's birthright, granting him the power of clairvoyance, immeasurable wisdom, and shapeshifting as well as great magics. Later in life, he was said to be a poet at King Arthur's court - a matter of ambiguity that only grew more mysterious with later tales. Many of his stories are collected in the Book of Taliesin, but the strangest by far is the Preiddeu Annwn, or Spoils of Annwn - a story of his journey to Annwn, the Celtic underworld, accompanied by Arthurian knights. They encountered a great glass castle and a pearl cauldron - later believed to be the predecessor of the Holy Grail. Only seven knights returned from that trip, the rest lost or sacrificed. Since that day, Taliesin has kept the Annwn grail for himself, using it to maintain his life and power for centuries upon centuries - he is not a Servant, but the original man, staving off the decay of his soul with increasingly large amounts of power from the Annwn grail. He had to "refill" it every so often through the ages, but the quality of souls in the modern era is nowhere near enough to fill his grail the way heroes once did, necessitating his crude imitation of the HGW - he is summoning the heroes for little more than entertainment, waiting for the last one to die so he can feast on their power and grant him another century or two of youth. As Gamemaster, his authority over Bardsley - an island built over the glass castle he encountered so long ago - is absolute and the Servants are little more than his familiars, allowing him to end their life at any time should they try to attack him by simply "formatting" the glass vessel he crafted into an empty puppet. As such, while Ruler is a threat who can only be stopped by Servants, Taliesin the Gamemaster can only be resisted by the human magi themselves, an unlikely feat at best.